Will Windows 8 Survive in the Post-PC World? Windows will lose its place as the dominant computing platform over the next four years, supplanted by ARM-based devices running Google's Android operating system, according to a report from IDC. A "dramatic shift" will take place, IDC says, with the market share of Windows devices based on the x86 architecture dropping to 25.1 percent in 2016, a significant slide from 35.9 percent in 2011. Meanwhile, devices running Android will see their share grow to a market-leading 31.1 percent in 2016, up from 29.4 percent in 2011. Devices based on Apple's iOS operating system will also gain during the period, to 17.3 percent of the market, from 14.6 percent in 2011. Despite the burgeoning market for Android devices, many makers will find it difficult to stay in the black, according to Tom Mainelli, director of IDC's Mobile Connected Devices program. "Android's growth is tied directly to the propagation of lower-priced devices," Mainelli said in a statement. "So, while we expect dozens of hardware vendors to own some share in the Android market, many will find profitability difficult to sustain." What's more, the Android market won't leech developers from the smaller iOS realm, he observed. "[W]e expect a large percentage of application developers to continue to focus their efforts on iOS ... because iOS end users have proven more willing to pay for high-quality apps," he said. 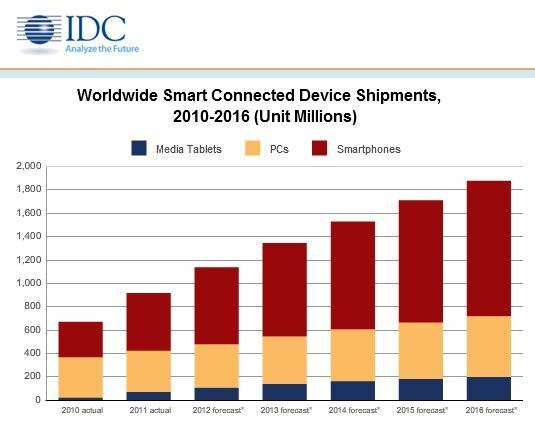 As more "smart connected devices" -- smartphones, tablets and some personal computers -- enter the market, the multiple device user will become the norm, according to IDC. That will create a challenge for makers of those devices. "The trick, moving forward, will be to integrate all these devices into a unified whole through use of personal cloud-type applications and services," Bob O’Donnell, IDCs vice president for clients and displays, explained. "That's the real challenge of what we have often called the 'PC Plus' era." Overall, 916 million smart connected devices were shipped in 2011, generating $489 billion in revenue, IDC reported. This year, it predicted shipments would reach 1.1 billion, and by 2016, 1.84 billion. The IDC report, although careful to avoid the volatile phrase "post-PC era," will add gasoline to the heated discussion on that topic. Before dying, Apple cofounder Steve Jobs declared the world had entered the post-PC era. His sentiments were later echoed by IBM. Nevertheless, there are those who would argue that post-PC devices supplement a PC infrastructure and are not a substitute for it. Yet others would point out that the death knell for PCs have been sounded many times in the past, but somehow they always find a way to survive.